Full Sleeve Cotton Gambeson, Size S, Black - this item is being discontinued. Full Sleeve Cotton Gambeson, Size M, Black - this item is being discontinued. Full Sleeve Cotton Gambeson, Size L, Black - this item is being discontinued. Full Sleeve Cotton Gambeson, Size XL, Black - this item is being discontinued. 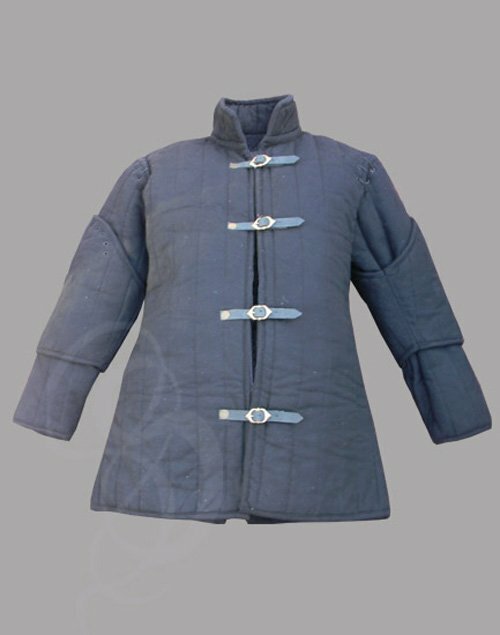 Full Sleeve Cotton Gambeson, Size XXL, Black - this item is being discontinued. Full Sleeve Cotton Gambeson, Size S, Ecru - this item is being discontinued. Gambesons(also called Aketons, Arming coat, Bambikions, Haquetons or Subarmalis)are padded under tunics. 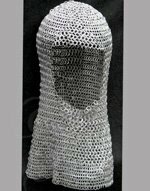 They are traditionally worn under chainmail or metal armor to help support the weight of the chainmail or armor. 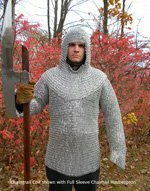 The gambeson assures that the metal armor stays at a safe distance from the skin. 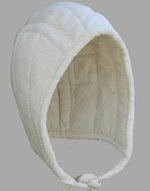 In combat situations this helps to cushion blows and minimize injury. Our gambesons are high quality handcrafted and made of heavy duty cotton. 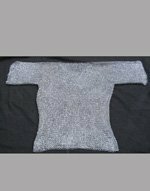 Offered in stylish black they can be worn without chainmail as medieval costumes or LARP events where full armor is not used but some light protection is desired. (1) Width under the arm pits. (2) Length of the full sleeve. (3) Length from shoulder to bottom of the coat. (4) Circumference of sleeve at the upper end. (5) Circumference of sleeve at the wrist. (6) Width at the waist. (7) Width at the bottom of the coat. (8) Circumference of the neck line.